It feels odd to not have shared the beautiful summer season with you here but taking time to focus on personal projects was something I really wanted to do. I needed space to get creative offline for wedding projects and time to focus on my studies, which I'm very delighted to let you know I have passed both qualifications I have taken! I really wanted to continue my manifesto project through the year, however full life became. For me each season brings with it something new, a new chapter. I take real pleasure from noticing the changes and love the blurry edges to the seasons as they move to the next. My word of the year is Awaken and with this in mind I decided that I wanted to awaken more of a connection to the seasons than I have done before. I want to awaken more awareness and I want to awaken my senses. To help me achieve this I've been writing a manifesto for each season of the year. A manifesto for me is a statement that pulls together my thoughts and the key things that what I want to get out of the season ahead and to help act as a guide. For me it's about thinking of the simple pleasures I love during the season, celebrating what the season brings, creating direction, actions, and practical and achievable intentions, with the outcome of connecting more to each season in an intentional and focused way. Life is full and creating a practice to allow myself to intentionally become more mindful is a such a good thing. Living with and observing the seasons is something that I do unconsciously, I adore it, but I want to awaken more of an awareness. 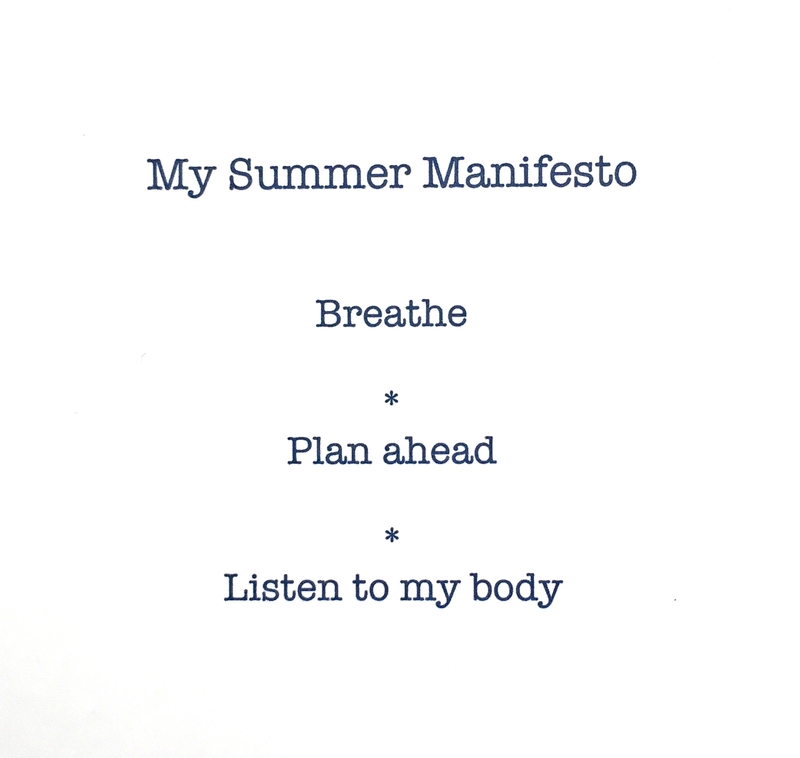 My summer manifesto was very simple and purposefully so. To help me navigate an incredibly full summer I decided to keep it so true to me and what I believed I may have needed to bring into my life. You'll notice that it can probably apply to any season, there's no connecting to nature as such, it has all been about keeping a gentle focus on myself. I knew that this really was what I needed. Taking time away at the Sisterhood Camp in May enabled me to breathe, think and plan. I knew that bringing this into the summer season, that would be full of making and creating, would help me to really be able to take the right decisions and best path through the months ahead. Breathing during yoga, breathing through the tricky moments, breathing in the scents of the season for me were all part of Breathe. Breathing delicious scents of summer food, plants and the materials I was working with will solidify my experience of this summer. Taking a moment to just breathe through it would help me calm any feelings and thoughts I felt and would help me relax. When doing yoga really breathing and listening to the breath helped take my mind off thoughts I had. Plan ahead was all about how I wanted myself to be and act during the summer. Planning small steps to the final outcome and setting personal deadlines helped me complete large projects that I wanted to achieve. As a lover of lists and plans I created detailed lists and spreadsheet plans for each element of the wedding planning. I tracked what I could in my Get to Workbook, putting pen to paper was sometimes all I needed to feel calm. I knew that with so much going on that I had decided to do for both the wedding planning and the two qualifications, that I would potentially be pushing myself hard and not looking after myself as much as I could have done. I knew that listening to my body would be a solution and enable me to tap into my intuition. During the time of studying I took time away to reflect and gave myself regular breaks. I stopped if I felt tired, knowing it could be done with the help of the plans I had made. I listened to my body and ate salads and drank smoothies to ensure that I was having plenty of fruit and vegetables but I treated myself to chocolate or sweet snacks when I wanted to. Having this simple seasonal manifesto became really powerful for me. For this season it wasn't about listing everything I wanted out of the summer, in terms of capturing the season and everything I wanted to do. Instead I've sculpted a season of my life and have given myself the freedom of choice in how I continue to want to feel during a season, how I want to play and grow with the manifesto idea, and the simple element of awakening something new in me. This summer I've awakened a sense of resourcefulness through the three elements of the manifesto, I've awakened an inner confidence of my skills, and I've awakened my creativity. It's been truly wonderful!